The Massacre of the Innocents is a part of the Christmas story that we rarely include because of its horror. The Newtown tragedy, touching the same nerve, forces us to recall pain. Herod, sometimes called the Great, had been elected king of the Jews by the Roman senate around 40 BC. His jealousy for his throne is well documented historically and proven unquestionably by his execution of his wife and two sons, whom he suspected of plotting against him. Most scholars now think that the number of children killed was probably under 20—about like Newtown—not a big number—unless it is your child! Anne Rice, in her historical novel based on the early life of Jesus Christ the Lord: Out of Egypt used a very interesting insight to carry part of the plot. As she imagined the family of Joseph and Mary, living in Egypt for several years, she portrayed them never mentioning to Jesus why they moved to Egypt, lest he be burdened with a sense of guilt for his birth causing the death of the other children born in Bethlehem about that time. Three hundred thousand children were killed in the Rwandan genocide of 1994, most with machetes, not guns. Over a million Jewish children were killed between1939-45 by the Nazis. Most of them were gassed or died from disease or other consequences of a concentration camp. You can add to that million perhaps another half million children whose parents were gypsies or other Nazi-deemed inferior races. Lest we think that only others do such things, think about how many African children died being transported as slaves to the Americas. Or what about the last great battle against the American Indians at Wounded Knee, where the U.S. 7th cavalry killed 90 men and 230 women and children. One estimate is that at least 20% of the soldiers in the U.S. Civil War were under 18 years old, a war in which over 700,000 soldiers died, which would mean 140,000 were just children. The problem is not gun control; the issue is not mental health; and killing children is not primarily an American problem. The disease is the reality of evil! The symptoms present themselves quite often violence—especially violence toward the innocent! With very difficult diseases, sometimes we start by trying just to relieve the symptoms. We can begin fighting evil by opposing violence in our culture. How many of your favorite TV shows depend on violence to carry the plot? And what about the video games that you play—or that you let your children play? And what language do you use to talk about those you disagree with politically? Morally? Do you use peacemaker language or abusive, invective language? And are you all about fights and wrecks and doing damage at sporting events? Every Christian should take inventory of their own lifestyle and become acutely sensitive to the intersections–in whatever degree–with violence. Regarding the problem of evil, only God can defeat evil, and He has, but there are still some battles to fight. Did you know that Robert E. Lee surrendered on April 9, 1865, but that President Johnson didn’t declare the Civil War ended until May 9, and that the last Confederate general did not surrender until June 23? Jesus defeated the Enemy completely on his day of resurrection, but until He comes again, more children will die because of Evil. And so the Christmas story of the Massacre of the Innocents does have a place today! Although Herod may have thought he won the battle, the baby he sought to destroy would win the war just 33 years later. The children who died in Bethlehem and the parents who grieved them, and we who grieve losses, can take comfort knowing that Evil does not win! 14And the Word was made flesh, and dwelt among us . . . (John 1). 7And she brought forth her firstborn son, and wrapped him in swaddling clothes, and laid him in a manger; because there was no room for them in the inn (Luke 2:7) and he [Joseph] called his name JESUS (Matt 1:25). 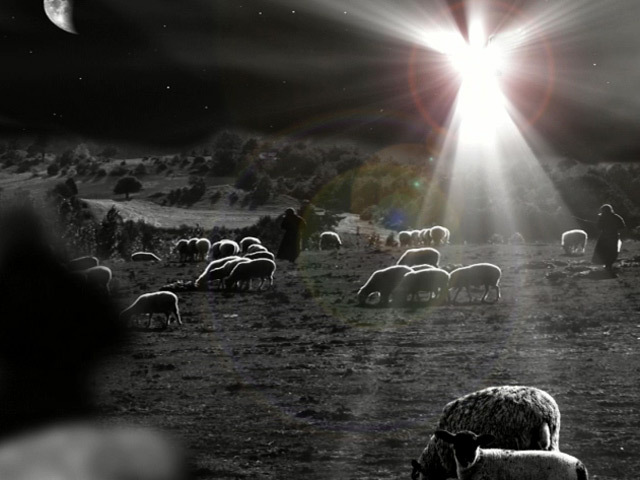 8And there were in the same country shepherds abiding in the field, keeping watch over their flock by night. 9And, lo, the angel of the Lord came upon them, and the glory of the Lord shone round about them: and they were sore afraid. 10And the angel said unto them, Fear not: for, behold, I bring you good tidings of great joy, which shall be to all people. 11For unto you is born this day in the city of David a Saviour, which is Christ the Lord. 12And this shall be a sign unto you; Ye shall find the babe wrapped in swaddling clothes, lying in a manger. 16And they came with haste, and found Mary, and Joseph, and the babe lying in a manger. 17And when they had seen it, they made known abroad the saying which was told them concerning this child. 18And all they that heard it wondered at those things which were told them by the shepherds. 1Now when Jesus was born in Bethlehem of Judaea in the days of Herod the king, behold, there came wise men from the east to Jerusalem, 2Saying, Where is he that is born King of the Jews? for we have seen his star in the east, and are come to worship him. 7Then Herod, when he had privily called the wise men, enquired of them diligently what time the star appeared. 8And he sent them to Bethlehem, and said, Go and search diligently for the young child; and when ye have found him, bring me word again, that I may come and worship him also. 9When they had heard the king, they departed; and, lo, the star, which they saw in the east, went before them, till it came and stood over where the young child was. 10When they saw the star, they rejoiced with exceeding great joy. 4In him was life; and the life was the light of men.5And the light shineth in darkness; and the darkness comprehended it not. 9That was the true Light, which lighteth every man that cometh into the world. 10He was in the world, and the world was made by him, and the world knew him not. 11He came unto his own, and his own received him not.
. . . and we beheld his glory, the glory as of the only begotten of the Father, full of grace and truth.